ABSeeds is not selling seeds for the next few months, but we hope you find our growing guides useful. Sow chillies from late winter (Feb) to late Spring (April to May) depending on the variety and how long it takes to mature. 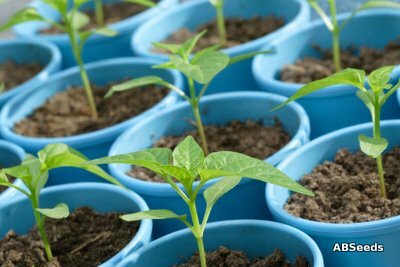 Habaneros and Scotch Bonnets should be sown as early as possible, whereas some of the smaller chilli plants can be sown as late as early May and still produce a crop of chillies. Seeds should generally be sown on top of a good organic (preferably peat-free) compost. You can use a special seed compost for this or you can use a good, fresh general purpose compost if you take out some of the larger pieces of material. Seeds should then be covered with about 0.5cm of potting mix, vermiculite or perlite and very gentley watered in. Water from below by standing in a tray of water and letting the moisture soak upwards until the top looks moist, or use a fine watering can rose, or a bottle-top waterer. Seedlings will grow successfully in 3-4cm modules or sow 2 or 3 seeds per 7cm individual pots and take out the weakest seedlings. Germinate at room temperature, or use a propagator set to 20C-25C. For seeds that want to be really warm, such as Habaneros, Scotch Bonnets, Fatalii or Rocotos, you could try starting them in an airing cupboard, but make sure you check daily and move them into good light as soon as they start to sprout. Grow the chillies on in good light on a sunny windowsill or in a conservatory, keeping them at room temperature or at least, not lower than 16C to keep them growing strong. If it's too dark and warm the seedling will grow weak and thin. Seedlings in modules should be potted as soon as they start to look crowded, seedlings in larger individual pots can wait a little longer. When chillies are looking a large for their pots, or if you can see white roots starting to make their way out of the bottom, pot the chillies on into bigger pots. For the smaller, compact varieties of chilli that are to be grown as ornamental indoor plants, use two plants per 20cm pot, or three into a larger one. Outdoor and larger plants will need bigger heavier pots so that they are stable and have enough potting mix to feed and provide water for the bigger plants. Choose pots that are 30cm or more in diameter. Chillies indoors will grow happily in any good organic compost. Outside try our recommended potting mix for patio vegetables. Keep them growing in a sunny spot until they are well established in their new pots. Some of the larger or more robust chillies will grow well outside in a sunny spot. The time you choose to put your chillies outside should depend on the weather and whereabouts you are in the country. It's vital that young plants are not exposed to frost or low temperatures. Frost will likely kill them, and anything below 15C will cause the plant to sulk and stop growing for a while. So, you need to wait until the weather is consistently getting warmer at night. This could be May or June. Plants should be progressively acclimatised to the outdoors by placing them outside for a few hours, then a few more hours each day, over a period of 2 weeks. This is called hardening off. Use your judgment about placing the plants outside, if the weather turns bad, you can keep them in for a day or two. Chillies should be kept just moist, but not wet. Never let the compost dry out completely or it will be really difficult to re-wet and your plants will suffer. Larger pots require less frequent watering than small pots, pots in full sun will need more watering than pots that are in light shade for part of the day. A small plant in full sun may need watering every day. When you water, make sure you water deeply so that the water gets down to the roots where the plants need it, rather than just wetting the top where it will evaporate away. Chillies don't need much feeding. Wait until after fruits have formed, then you can use a half-strength dilution of organic tomato food once every two weeks. Chillies growing in this country are largely untroubled by pests. In very warm, dry conditions they may be attacked by red spider mite (you'll see very fine webbing and tiny little mites on the underside of leaves). Sometimes aphids can be a problem. The answer for both of these is to use an organic fatty-acid type spray (like Eradicoat) suitable for use on food crops. This suffocates the pests without damanaging the chillies. Occassionally a chilli plant may fail to set fruit. 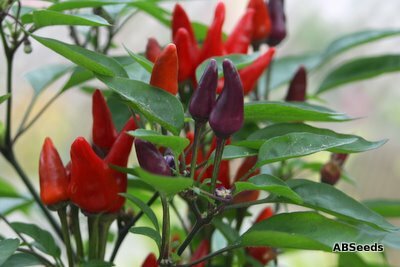 Poor watering may be the cause, if chilli plants are allowed to dry out and wilt they may fail to flower or drop their flowers early. If your indoor plant is otherwise healthy and has plenty of flowers, but doesn't set fruit this may be a failure of pollination. To help the flowers pollinate indoors, tap the flowers or lightly shake the plant to spread the pollen. You can also use a cotton wool bud and lightly sweep from one flower to the next to spread pollen.